Mobile Bingo Bonuses brings one for the food lovers out there a little bit of Tasty Bingo. This amazingly colourful site will tickle your bingo playing taste buds. But don’t be mistaken to believe that Tasty Bingo is just bingo only, they also offer casino, progressive jackpots, instant wins and online slots. But if you’re a bingo lover only then we’re sure you’ll be satisfied by their delectable and satisfying bingo experiences, from 1p bingo, to games with huge jackpots, most starting every 3 minutes. Added to this is the fact that you can play their amazing games on your mobile with their latest bingo app. So if you have a smartphone including Android and iPhone or a Tablet device then you can play anytime or anywhere. So with guaranteed jackpots of over 1,000 every week, weekly tournaments and over 100 slot games Mobile Bingo Bonuses is here to show you why this is a site to take a bite out of. Lots of promotions, offers and games. When you make your 1st deposit between £5 and £100, Tasty Bingo will give you a 200% welcome bonus plus an extra £10 bonus funds on top of that. This means that if you deposit £10 with the 200% they will give you £30 and with the extra £10 you’ll have £40 to play with. 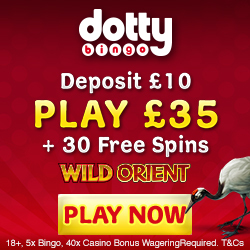 Once you’ve played through your 1st deposit you will be looking to make further deposits and this is where you will discover that Tasty Bingo keep on dishing out. 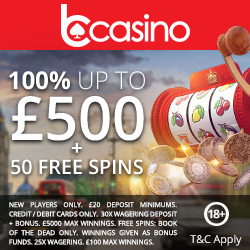 For every subsequent deposit you make between £10 and £100 they will give you an extra 50% bonus credit. £55 Dinner Date – Win £55 cash and a 100% bingo bonus every week just for playing all your favourite bingo and Instant Games. £155 Tourney Teasers – Get your bank balance into shape every weekend. Play their £155 Tasty Teasers Bingo and IG Tourney every Thu – Sun and pile on the pounds in your pockets, not your waistline. Aztec Rising Challenge Edition – Win up to £10,000 every 7 minutes in Tasty Bingos NEW Aztec Rising Challenge Edition slot game. Challenge your bingo mates across all Joy sites in real time to top the IG leader board and win. Cash Fountain – Swim in a fountain of cash every evening in the Hot Chocolate room from 7pm – midnight. Win up to £500 cash on the hour, every hour in our sliding jackpot. £30 Sneaky Snacks – Play their £30 Sneaky Snacks games in Cheers and Tangy Tomato rooms and bag £30 cash hourly. Tasty Bingo also believe that bingo is great alone but better when you’re with friends, which is why they introduced Tasty Team Bingo. Team bingo is about ‘all for one and one for all.’ The more you bingo and your fellow aspiring chefs play, the more points you’ll earn and the closer you’ll get to win a seriously Tasty amount of bonus points. Additional bonus points are available merely for your loyalty, playing bingo, slots etc and referring a friend. Later, you can convert these points into Bingo funds in your account or exchange them for other special treats we may offer you from time to time. Yes, Loyalty Points are really are very good for you. You could even be welcomed into their Joy Gem VIP Club where you will receive sparkling promotions and benefits by ensuring you feel precious no matter what level you are. Added to this is the fact that when you become a VIP on Tasty Bingo you also join other sites VIP clubs including Wink, Posh, Tasty, RedBus, BingoStreet, 888ladies and Bingo Loft. Sounds great doesn’t it, well simply head over to Tasty Bingo to register and enjoy.